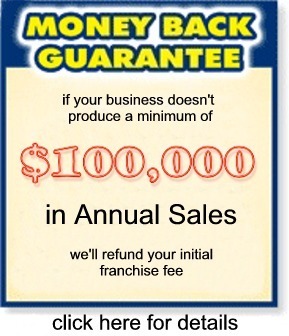 Great Concept, Fast Growing Network, New Ideas, and the Best Franchise Terms available. The following figures may help you to project your possible income. These figures are not intended to present information concerning actual sales, costs, income or profits. They reflect revenue based on specific parameters. The actual results will vary from one office to another depending on the cost of advertising in the area and the amount charged for the service. 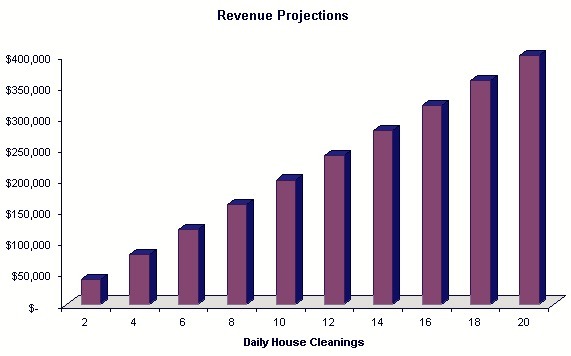 These figures are based on regularly scheduled residential cleanings. They do not reflect the income potential from additional add-on sales from other services you will most likely offer such as: spring cleanings, the inside of appliances, window washing, move-in/move-outs, new construction cleaning, property maintenance, office cleaning, etc. There are several other services you can offer to enhance your business. Office cleaning is one of the most requested. Our business system includes an Operations Manual on bidding and cleaning small offices and commercial space. Window cleaning is another. Most maid services do not offer this type of service. Our business system provides you with an Operations Manual on window cleaning detailing the methods and techniques used in the industry. Move-in/Move-outs, also referred to as turn-key cleaning, or property maintenance cleaning is an additional service you can offer. Not only do we provide our services to the home owner who is moving in to or out of a house, we clean rental properties and apartment complexes. We also work closely with real estate companies to maintain the model homes in new developments, and unoccupied houses that are on the market for sale where the owner has already moved. New Construction cleaning is another kind of service you can offer. Every new house, office, apartment, condominium or building must be cleaned after the construction has been completed. We have included all the information on how to find these jobs, price them and clean them in our Maid Service Operations Manual. Plus additional services such as: Laundry & Ironing, Pet & House Sitting, SafeGuard Calls & Visits, Errands, etc.